Recent estimates suggest that 10% – 15% of couples experience infertility, and there are now a greater number of women attempting pregnancy at an older age when they are less fertile. This has contributed to the increase in the use of alternative treatments such as acupuncture treatment to help increase chances of conception. What is acupuncture treatment for infertility? The most important aspect of infertility acupuncture treatment is knowing your body and yourself. In terms of a women’s fertility, there are four organs – Kidney, Spleen, Heart and Liver, and four vital substances, Yin, Yang, Qi and Blood that are most likely to be suffering from imbalance caused by excess, deficiency, or stagnation of energy. Acupuncture treatments of infertility are based upon restoring balance and health to these systems and vital substances. Acupuncture treatments can help you bring your system back into balance, restore you to greater health and well-being, and prepare your body to conceive healthy children and carry them to term. Also, you will probably have more energy, your emotions will be more even, and you will approach life with a much better perspective. As well as the acupuncture treatments, I will give nutrition and lifestyle advice on balancing your body physically and mentally. 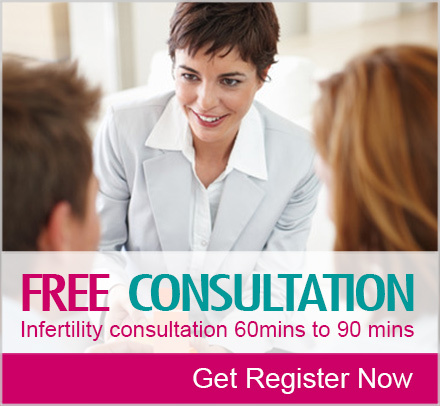 In my clinic, the first infertility consultation which normally takes 60mins to 90 mins is FREE of charge. I decided to do FREE first consultations because I believe the consultation is very important for both you and me. As your therapist, I need to clearly understand you and your condition, which helps me to choose the best acupuncture treatments for you. Infertility acupuncture treatment is not simple. It may take time. Therefore, I believe the relationship between you and I (therapist) is very important. Through the first-time consultation, you will know whether you can trust your therapist or not. When you feel comfortable about me and the prescribed acupuncture treatments, we will start your treatments. The acupuncture treatment is not a quick magic fix. Restoring the body to health takes time. You must give yourself at least three months for the treatments to have full effect. Give your body a chance to heal itself and make progress. For best results of the acupuncture treatments for infertility issues, I believe in most cases in having acupuncture treatments once a week for the first two to three months then fortnightly after this. There are now a greater number of women attempting pregnancy at more advanced ages when they are less fertile, and this has contributed to the increase in the use of assisted reproductive technologies (ART). In Vitro Fertilisation (IVF) is now an accepted and effective treatment for infertility. A recent systematic review and meta-analysis concluded that acupuncture improved the clinical pregnancy rate (CPR) and the live birth rate (LBR) among women undergoing IVF. In addition, another study found acupuncture reduced anxiety and increased relaxation and optimism for women undergoing IVF. I am very happy to work with your specialist to share our knowledge. Please feel free to talk about acupuncture treatment with your specialist.